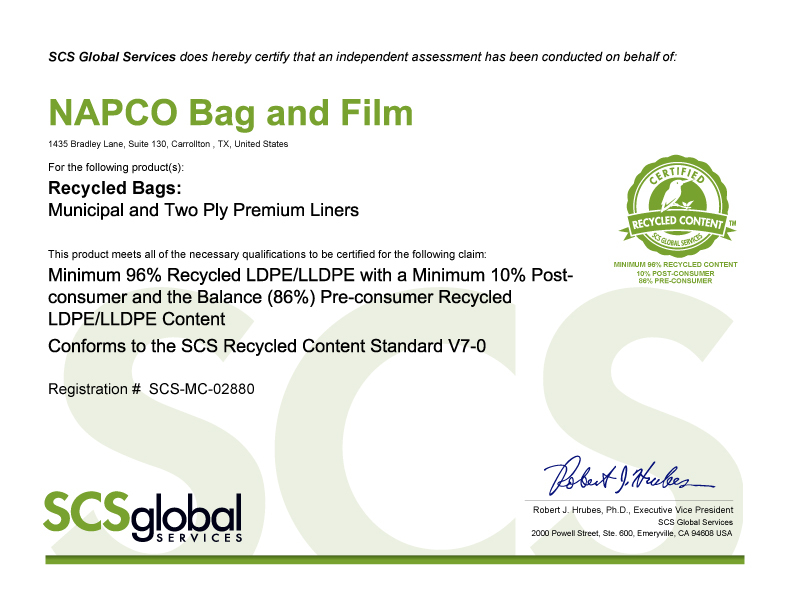 SCS Global Services does hereby certify that an independant assessment has eben conducted on behalf of: NAPCO Bag and Film For the Following product(s): Recycled Bags: Municial and Two Ply Premium Liners. This product meet all of the necessary qualifications to be certified for the following claim: Minimum 96% Recycled LDPE/LLDPE with a minumum 10% Post-consumer and the Balance (86%) Pre-consumer Recycled LDPE/LLDPE Content. Conforms to the SCS Recycled Content Standard V7-0.